With a good retractable leash for dogs your pup will enjoy more freedom of movement while allowing you to walk at different speed. It's fun but you have to keep safety in mind, more about that in a bit. First, here are our top five choices for this year! If you are still using the regular rope leash, then you might want to reconsider your decision. Not only are you making your every outdoor walk with your pet more exhausting, but you are also limiting its movement freedom too. Perhaps you should consider switching to a more modern variant that uses automatic lead extension and retraction. For biking with your pup choose one of dog bike leashes. It will make your life a lot easier. Retractable leashes are one of the finest innovations of modern civilization. If you don’t believe us, just go out and spot how many owners are using them. These simple accessories introduce so much convenience into what can at times be an exhausting experience. Running around while your pooch pulls you in every direction wherever it wants to go is not a pleasurable experience at all. It is why we wrote this article that explores some of the models currently available on the market. If you are wondering which is the best retractable dog leash among the sea of emerging products, you are in the right place. Be sure to keep reading and pick your favorite. If you’re in a hurry check the TaoTronics Retractable Leash For Dogs: Made out of high-quality materials, this is our personal favorite because it has the best ergonomic grip and brake mechanism that we’ve tested in this roundup. When it comes to giving the highest ratings to any product, it must excel in quality, performance and price aspects to earn the bragging rights. TaoTronics product manages to impress in every way and leave users very satisfied. 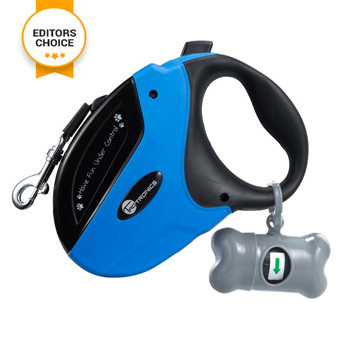 It offers superb functionality and quality while still retaining a reasonable price that makes it an ideal retractable leash with bag dispenser. It rightfully takes the number one spot on our review list. With an ergonomic handle shape made using high strength plastic, you will never have to worry about breakage or blisters no matter how large your pet is. Holding this lead is a comfortable experience that leaves you confident of its reliability during outdoor use. Being certified for up 110-pound, you will be able to hold your pet without too much effort due to the overall smart design. The locking toggle button on top of the leash holder controls the brake which allows the strap to either fully extend to 16 feet or hold its current position. The switch mechanism feels very tactile although we would like that it has less wobble during operation. Because of the ribbon surface texture that’s a durable nylon weave, the brake holds its place no matter how hard your pooch pulls. On the practicality side, TaoTronics lead offers so much versatility when you account for the retractable design that makes it easy to carry and store when not in use. There is even an attachment for a roll of waste bags in a cute bone shape container that comes for free in the retail package. That with weatherproof and heavy-duty design makes this a product that can and will last you a very long time. When you want only the best for your doggie, you should pay attention to the overall product quality and its durability. TaoTronics ticks all of the boxes and even adds an affordable price to the mix which makes it hands down the best choice product. Being a part of modern society means that most of us go through a busy working day that leaves little time for taking our furry pets for a walk. Friends Forever have this in mind, and that’s why it offers a unique product that comes with a flashlight. A perfect choice for busy pet owners who like to take their pet on night walks after a busy day at the office. If you prefer going out at night with your pet, then you should seriously consider this leash. It features a reflective coating that glows every time light shines upon it. A great feature for night time visibility that keeps both you and your pet safe. The included LED flashlight is perfect for use in pitch black conditions when you need to see where you’re going. The detachable included flashlight also doubles as a poop bag holder and a treat dispenser. The lead also features a hook for holding full waste bags and a slit that keeps the remaining ones in place and ready for action. The resealable tab is a nifty feature that allows you to maintain the doggie treats fresh and dry no matter the outdoor conditions. Available in both 16 and 20 feet line lengths, you can use it to hold on to even the heaviest, up to 120 pounds of weight breeds, with a pull rating of up to 360 lbs. We wish that the leash material itself was more tear resistant as it no rips proof which is a bit disappointing. Comfort wise, it is great to hold and offers an excellent grip stability no matter how hard your pet keeps pulling. If you are looking for an outstanding, low light use suitable, dog leash for pullers then you should consider this Friends Forever model. It will keep both you and your pet safe at night on busy streets due to its smart high visibility features. If you happen to be a proud owner of a hard-pulling doggie that rushes to explore with substantial force, then this might be an ideal product for you. Hertzko offers a heavy-duty variant leash that will keep even the strongest breeds in check. Featuring high-quality materials, you will never have to worry about a runaway pet anymore. When you have an active and energetic pet, you need to have a leash that will keep it in place and hold it when it spots something exciting. This Hertzko made model uses a combination of durable materials and reliable internal mechanism that can keep your dog in check when you’re outdoors together. It is also a great leash for smaller dogs thanks to its full adjustability. Quality wise, you can expect reliable operation and a decent amount of durability for no matter which breed of dog you intend to use this lead. We only wish that the nylon made ribbon was rip proof however because of the flat design, this is standard for every similar product on the market. It’s 16 feet of length gives lots of space for your pet and allows it to explore its surroundings freely. The Super Grip handle is ergonomically designed for maximum comfort while keeping the grip levels high for added security. It features a strengthened design to help hold it in owner’s hands even if your pet violently pulls away. Overall build quality is excellent, and there are lots of premium materials featured all over the handle construction. After testing this model for several weeks, we can report back with a pleasant overall experience. Hertzko Heavy Duty model is an excellent choice for active breeds of pooches that like to run and pull hard on leashes without minding their owners. Flexi Explore wins the category of the longest retractable leash. When you want to give your pet freedom to move around and explore while still keeping it in line – you need a longer length line. It is where Flexi steps in with its product that will fulfill this need perfectly. Available in three sizes and different colors it will not only meet – it will exceed your expectations as was the case in our test. The German made products always instill users with confidence when it comes to quality and reliability no matter what. Thankfully this is also true with a Flexi leash, and if you don’t mind the basic design, it will impress you with its performance. It’s available in three different colors and comes in three sizes to allow owners to choose their own according to their doggie breed. The 26 feet long flat ribbon allows superior movement freedom to your pet that is unmatched by competing brands on the market. Once you want to shorten the distance, it is as easy as pushing the button that will activate the smooth retracting mechanism. The brake lock works very well even when the line extends to its maximum length. When it comes to comfort, we must point out that this isn’t an ergonomically designed model at all. It is simply decent to hold on to, and that’s just about it. The handle grip is sturdy enough to allow for a secure hold although it can become slippery when your hands get sweaty. It is disturbing to see plenty of fake copycat products that try to cash in on the great design of the original Flexi Explore. Pay attention that you buy ONLY the original product. It is an ideal choice for owners who are looking for a longer length leash for large dogs, and even though it costs a bit more than the rest of the competition, it is well worth it. Supports up to 110 lb. Taking two furry pets for a walk can be a frustrating experience if each of them starts pulling the other way. Luckily with the invention of dual leashes, owners can manage their active furry pals much easier than ever before. Wigzi Dual model allows you to keep two of your smaller dogs in check while still enabling them to explore around when they want to. We find it very impressive how we manage to control two pooches on a single device without any tangles or any other type of issues for that matter. The color coding on both the ribbons and the braking toggles help with individual control of each pooch. It is an incredibly useful feature when you have active furry pals running around. Handling and comfort are excellent, and because of the all-plastic build, there are no issues during longer periods of outdoor use. We must say that we miss some attachment rings that would make carrying waste bags much easier which is a must when walking out with two pets. The brake toggles feel very sturdy and aren’t that difficult to press down. We like the zero-tangle design that prevents getting any mix-ups. The ribbon is very durable and made to withstand chewing mishaps from smaller doggies. With a maximum rating of 35 pounds, you must not use this model if you own a heavier breed. It works best for smaller size pooches no matter how active and energetic they might be. There isn’t a better recommendation for owners who have two small doggies that like to go to walks together then Wigzi’s Dual Leash model. It features a great design and provides you with a right amount of durability regardless of its a bit higher price. What is the best material for a dog leash? Most of the models on the market use textile, composite and nylon weave as the primary material. You should always go for a synthetic fiber made ones since it offers superb durability and damage resistance. It is also perfect for holding more pulling weight than your dog will ever be able to produce. Other materials do a decent job although they might not be damage resistant as plastic made ones. If your dog likes to bite and chew then avoid models that use rope and textile. These will tear very quickly, and you will have to buy another replacement sooner than later. What is the weight rating and why does it matter? Every leash comes with a rating that is a measure of the maximum supported weight of the pet that it is going to be using it. It is a crucial stat as it helps owners purchase the model that will suit their pet correctly. It is also a measure of durability and strength of individual lead components so make sure to pay attention before buying. Choosing the cheaper model with a lower weight support rating for your pooch means that it will get destroyed during use. For that reasons, some manufacturers even state the maximum pulling strength. Make sure to know the weight and always pick the model intended for use with the size and strength of your pet. I have more than one dog so should I pick the dual leash products instead? A good rule is to make this choice based on your pets’ size and weight. Dual and Multi straps are designed for small to medium size breeds most of all. They might not be that great if you have large dog that pull hard when you take them out on a walk. In most cases dual leashes will be bulkier than standalone models and not as durable. If you want a secure and firm hold then always go for separate straps when taking big breeds outdoors. There are many cases of leash accidents and amputated fingers. You also have to worry about other people and their legs because a fast line can easily cut through flesh. Using the retractable lead doesn’t mean you can just let your dog run unattended. If you find yourself in crowded area make sure to use the lock the button that will prevent your pet from going where it pleases. Who invented the retractable dog leash? Most people are not aware that the maker of the original retractable dog leash was, in fact, the famous German manufacturer – Flexi. They were the pioneers who are responsible for designing and making one of the most iconic devices found in almost every dog owner’s home. Their success story is as surprising as it is inspiring. It was Manfred Bogdahn, CEO of Flexi, who came to the idea of making a useful line retracting mechanism that will revolutionize the industry. This family run company is responsible for making over 200 product variants during its 44 years of existence. And who would have guessed that it all started with an all wooden first model that was using a power saw starter mechanism for retracting? Today they make the most sophisticated and feature-packed models that make the outdoor activity of owners and their pets around the globe so much more enjoyable and fun. Flexi leashes enjoy a loyal following by customers because of the excellent build quality and impressive durability. 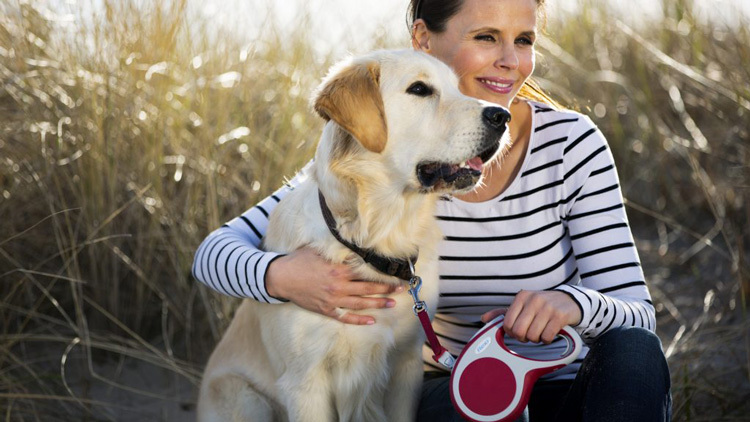 If you want to get a reliable accessory that will last both you and your pet for a long time then Flexi, the makers of the original retractable model, is the brand to choose. You might wonder how your cool dog leash operates with a single press of a button? The seamless transition between loosening up and retracting the strap might appear complicated, yet the way it works is straightforward. The large holding grip and the sleek body design hide away the internal components that make this a very easy to use accessory. The strap that attaches to the collar is intentionally flat so that it can fold up more easily into a roll shape. Inside of the housing that is usually in front of the handle grip hides away a roller that operates by using a spring. Every time you press the button the spring activates and either releases or locks into place. When you want to loosen up the line, the internal brake releases and decouples the spring into compression position so that the roller can move freely and unravel the lead. However, every time you want to retract the lead, the mechanism becomes free to force the roller to turn in the opposite direction of the lead end. It will appear to shrink in length when it is in fact only rolling up into a circular shape that is more convenient for storage when not needed. The smooth operation of the roller is possible due to the use of steel ball bearings on the inner side of the rope roller. It allows a friction free movement during extension and retracting which appears as a smooth motion to users. It is also a very silent way of operating so if your lead makes funny and loud noises know that it is using low-quality bearings so always make sure to read through owners’ feedback before buying. Even with a retractable lead you will have to leash train your dog. There is no substitute for good training and you have to make sure that whenever you call your pet back that it listens, otherwise you will end up chasing him/her around the park. Even with the option to loosen up the strain make sure that your pup is not pulling too much or it can risk neck injury like with normal rope leash. Teach your dog how to walk with a leash on, even a retractable one and you will have a great time! In the end, it is wonderful to know how such a simple working principle allows dog owners around the globe to effortlessly take their pets for a walk while still keeping them safe. You can release your pet with a press of a button or a toggle and let them explore anything they fancy without following them to that very spot. One of the greatest inventions of the 20th century, this is a product that all dog owners love and appreciate using in their daily lives. So there you have it, a sum of the ultimate retractable leashes for dogs. I’m sure you will find one that suits you and your pet, but if you are still in doubt, TaoTronics is our top choice overall.